When talking about the music of the Graz-based composer and organ player Klaus Land and the Viennese bassist and multi-instrumentalist Werner Dafeldecker , one could briefly say that there is a form of velocity so fast one no longer perceives it as such, but rather as stagnation. The speed of light is such a case. 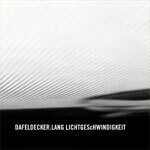 The music of Dafeldecker and Lang also appears to be stagnant. It doesn't get going anywhere. A powerful, droning organ chord, a bowed bass and both are perceived as if they were chiseled for eternity. Music that sounds irrevocable, great and sublime, fascinating and off-putting. And yet it isn't true: the monolithic is not everything that these pieces have to offer. Whoever listens carefully will soon discover that the big picture assumes the fine-kinetic work on the detail, that the music boasts a fine nerve center and subcutaneous branches that one does not find in many other minimal musics. One really has to be even more radical and ask oneself if the concept of minimalism has anything to do with this music. We don't notice the speed of light, light has always been there, somehow. This music, too, has somehow always been there. But we have the chance to experience its specific speed. The monolithic is not only a result for Dafeldecker and Lang, it is above all process. The tonal spectrum of this music, which one could compare to the harsh improvisations of the early AMM, or to several compositions of Kevin Drumms or to recordings from the radical minimalist school of Tony Conrad, cannot be summarized by this description. The recordings were made in a church in the southeast province of Austria on a snowed-in winter night.